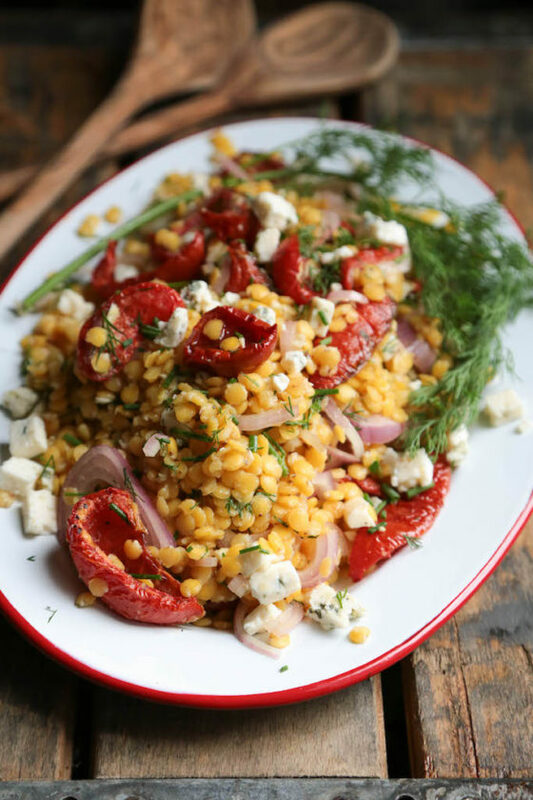 Bring a little cheer to your salad game with this lentil salad with tomatoes and gorgonzola! 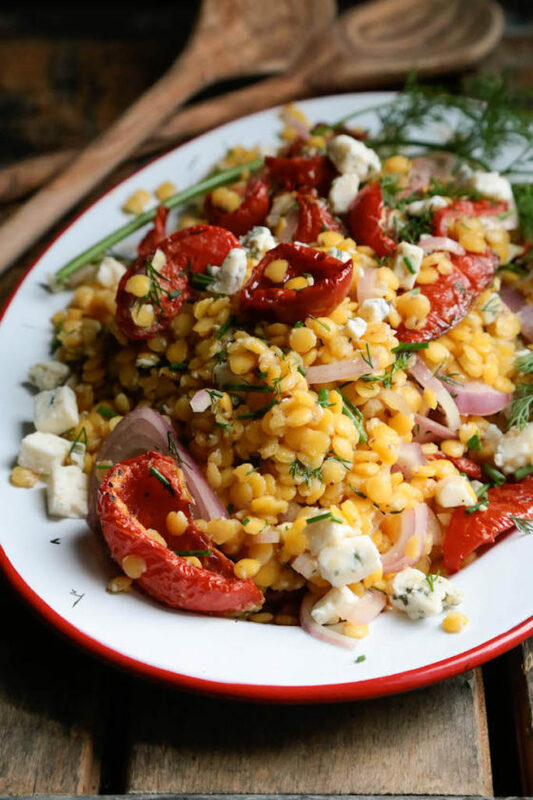 Colorful, fresh, and so easy, this will brighten up your lunch time! Do you follow me on Snapchat? Do you even Snapchat? I confess, I’m not as on board that whole social media train as others – but yesterday I had a very good reason for snapping. Yesterday was my last day on my previous construction project, and I threw out a few snaps from the parking lot of my job, as I walked in to my last day on my current program. 3 1/2 years has been spent working alongside Boeing, and now it’s time to move along to something new and exciting. But new adventures, and leaving the comforts, friendships, and the familiar behind is not without a little emotion – and we all know how good I am at emotions! But starting next week I’ll be starting a new job, with an equally indelible mark on the Seattle landscape. And, now I also go with a fancier title behind my name! Project Manager! Throw your hands up, people! I consider myself so fortunate to have worked on so many amazing projects, and leaving behind Boeing is definitely not without a little tug at the heart strings. If you live in Seattle, or the PNW, you can’t throw a rock without hitting someone that has worked for or at Boeing. It’s practically impossible. And for me – it’s something of a family legacy. As it turns out I’m a 4th generation Boeing-ite, with my great grandmother working for Boeing as a Rose the Riveter back in WWII, along with my grandmother, my dad, and now me. And that’s not even all of us!! There has also been my grandfather, a Czech refugee came to this country with no knowledge or airplanes, but became a lead designer determined to thrive. My bonus mom, who worked on airplane engines, and my bonus dad, too!! But I’m not going far down the aerospace path, just going from building the buildings that build their airplanes, to now, helping travelers reach their destinations in comfort and style, as a new assistant project manager on Seattle Tacoma’s International airport and helping Alaska Airlines with their new terminal! It’s hard to leave those you love behind – but knowing that they are cheering me on, and they will always be there for me, makes this endeavor all the more exciting. So, if you’re ever in Seattle – be sure to wave as you take off, I’ll definitely be able to see you! Preheat oven to 275 degrees. Quarter tomatoes, and clean of seeds. Dry with paper towel. Line baking sheet with parchment paper, and place tomatoes skin side down. Drizzle with olive oil, balsamic vinegar, and top with whole sprigs of thyme. Sprinkle with sea salt. Place in oven and roast for 90 minutes, until partially dried and quite wrinkled. *NOTE* If you prefer, speed this up by using prepackaged Sun Dried Tomatoes. In a medium sauce pan, prepare lentils according to package directions, and cook until soft. Drain. While lentils are cooking, slice shallot, and soak in red wine vinegar, and sprinkle with sea salt. Pour over hot lentils when done cooking and toss to combine. Toss in the remaining olive oil, garlic, black pepper. Cool mixture. 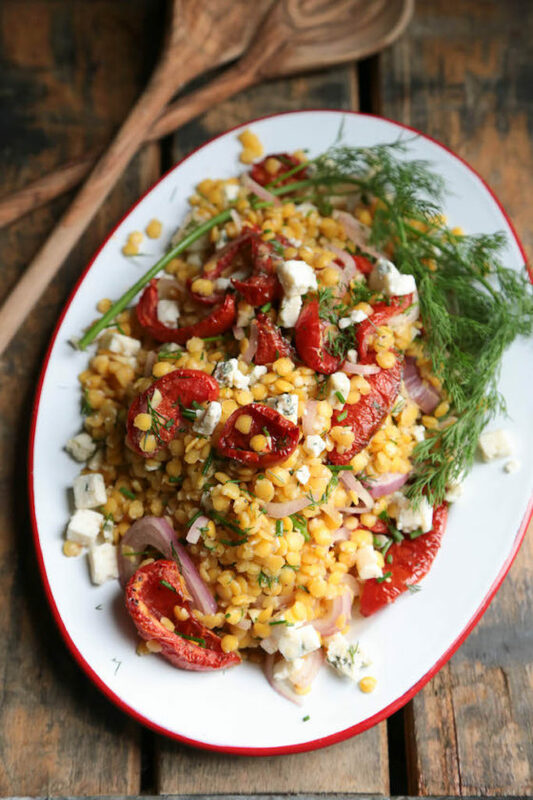 Toss in remaining herbs, and lastly crumbled cheese and roasted tomatoes. Serve. 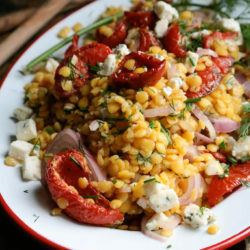 Recipe very lightly adapted from Plenty cookbook "Castelluccio Lentils with Tomatoes and Gorgonzola"